As an electronics engineer and music lover, Stéphane Even could not understand why he only rarely experienced moments of “pure grace” with his Hi-Fi system, despite the fact that he had good quality CDs and equipment. Ultimately, his dissatisfaction as a purchaser of high quality sound reproduction led him to leave his job as R&D Manager in a large company to become a Hi-Fi electronics manufacturer. And so it was that the Neodio brand was born in 2001. NEODIO was founded with the aim of pushing High-Fidelity sound quality to its limits. For 15 years Stéphane Even searched tirelessly for scientific explanations for the anomalies that he observed. Unconvinced by the traditional theories proposed by the manufacturers, he carried out more than a thousand experiments, fuelled by a passion to enhance his knowledge. This work revealed previously unknown phenomena that have a significant impact on perceived sound quality. Our products are designed with innovative technical solutions that combine elegance and simplicity. Any unnecessary complexity is eliminated. As with musical instruments, it is the quality of the design and the production that prevails. 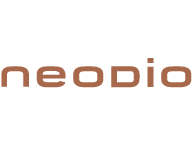 At NEODIO, High-Fidelity is achieved through technical research combined with a long, meticulous optimization process, based on listening. Our evaluation criteria focus on the naturalness of the timbres, the respect of the dynamic and the rendering of the sound image. For Stéphane Even, the only thing that really matters is the realism of the music, and the emotions that it generates. The search for technical perfection only interests him if it contributes to expressing the music’s complexity and its nuances. It is essential to differentiate the aspects of technical performance that genuinely add to the listening experience in human terms, from figures that are highlighted in marketing material. For example, what is the point in reducing an amplifier’s distortion to virtually zero, if the speakers then generate 100 times more? Why abandon PCM for DSD when we do not know how to fully exploit the CD format? Design firm based in Bordeaux. Based in Metz, Gravlor has produced all of our machined and folded parts since 2007. Based in the Dordogne, this company has a well-established supplier in the aeronautic, scientific instrumentation and rail industries. FEDD has manufactured all of our electronic cards since 2002 and assembles all our electronic, support and cable products. NEODIO products are assembled with the same rigour and by the same technicians as components for commercial aircraft.